One thing you will learn about Island Printing, is that we go above and beyond to bring you all the large format printing choices that you could ever need. Whether you are looking for custom-printed solutions or something more generic, we have you covered. Our agency offers a full range of services from start to finish, and one of the many services that we can offer you is A-Frame sign printing. So, What Are A-Frame Signs? A-frame signs are a traditional form of advertising and they help to attract the right attention from people right off the street. They have the power to bring people into your store, and if you’re working in real estate, you’re going to need our sturdy and durable signs more than you think! Advertising signage that stands out in all weathers needs to be as sturdy as possible, and these are way more affordable than you think. Not only are they affordable, but they are portable. You can fold them up and move them from place to place, meaning that you have fluid advertising without having to buy posters over and over again. You can use them at events and trade shows, too, so that you can attract attention from those who need an ideal way to promote their business. A-frame signs and sandwich boards are one of the most popular and cost-effective ways to advertise in the street. We know that you will have a lot of questions about your a-frame signs, and we’re happy to answer every single one. You can call us today if you want to talk about a specific, custom project that you need designing and making, but in the meantime, check out some of the questions that come up most. All sandwich boards and a-frame signs can be double sided. You can choose to leave one side blank, but the idea is to attract as many customers as possible. 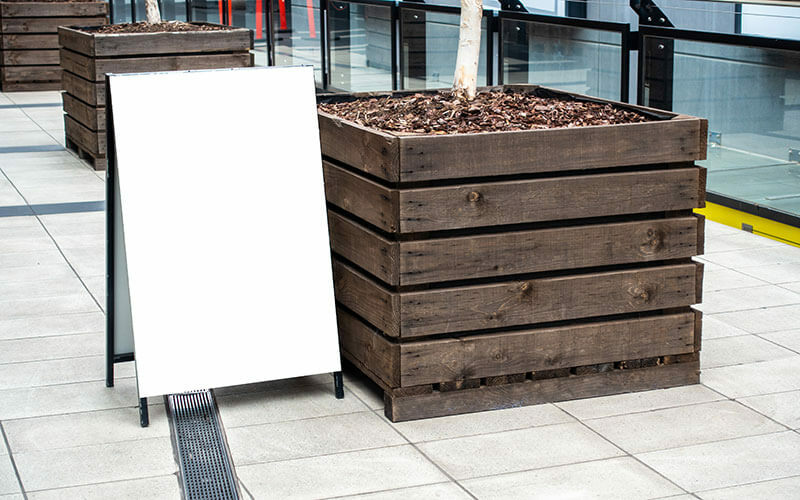 If you brand your sandwich board properly, you can print your message and brand across it on one side, or keep it a chalkboard style board. The choice is entirely yours, and you need to decide on your budget and advertising needs to tell which option you should go for. How durable are a-frame signs? As a-frame signs and sandwich boards are primarily intended for outdoor use, they are extremely durable. We only use the top-quality and sturdy products that we source, and while we do our best to use materials that are climate proof, you will still need to take care of them in inclement weather so that they don’t get ruined. The metal a-frame signs we make are designed for long-term outdoor usage. Can I fold mine up? One of the best things about our outdoor a-frame signs is the fact that they can be folded away. This means that they can be tucked into storage in your store, or folded into the trunk of the car when you are moving from house to house that you are selling if you work in real estate. They’re light enough to carry, too, so while they are durable in the climate outside, you don’t need another set of hands to carry yours. At Island Printing, we offer metal a-frame signs, sandwich boards, open house a-frame signs that will get your message across and drive traffic to your business. We are able to design and print a-frame signs to your exact colour and branding specifications, generating interest from the general public and turning that foot traffic into profit for your business. 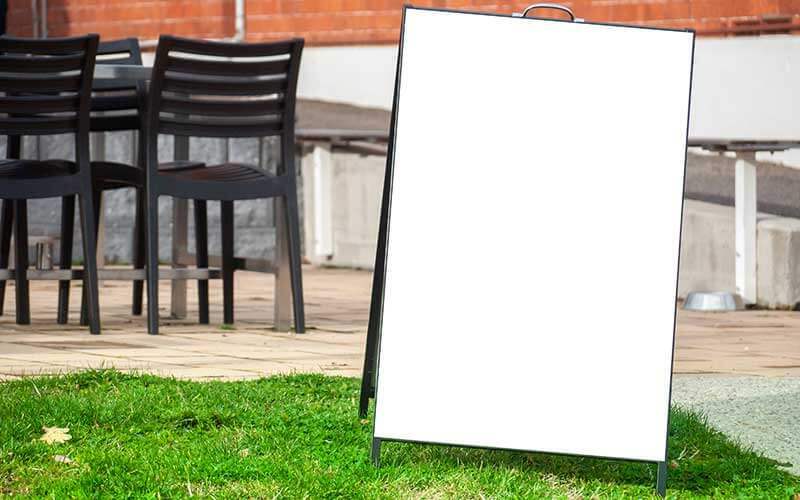 Sandwich boards have been an effective advertising tool for centuries, and the key feature for these essential marketing tools lies within their flexibility. It’s a tried and trusted method of advertising simply because of how well it works. Many businesses across the globe go for sandwich boards, and real estate agents love to use them as they can print their face and contact details on them and take them everywhere they need to go to advertise. A-frame signs are cost-effective. The amount you spend on these compared to other signage types is a fraction. You can project a comprehensive message that’s going to offer you an incredible return on your investment. With more money leftover from your marketing budget, you can pour your cash into things that are going to matter more. Most marketing signage stays where you put it; posters and hanging signs, etc. 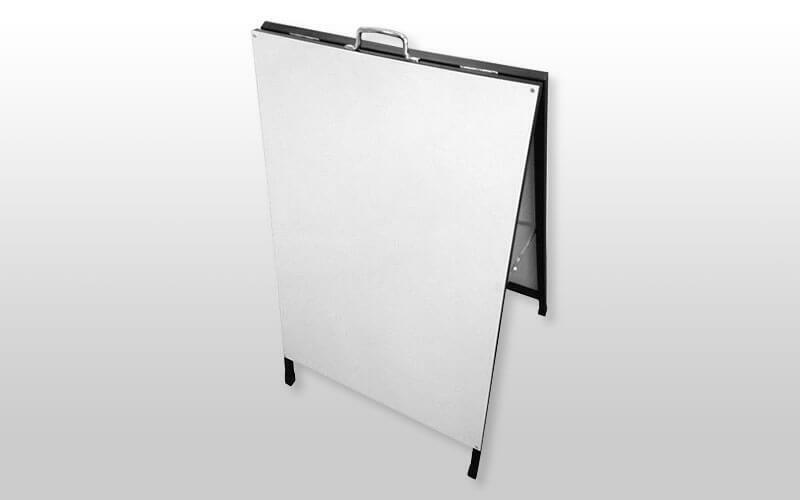 With sandwich boards, you can move your advertising with you from place to place. Display it outside a shop on one day and the next, take it with you to an exhibition. The life of your a-frame sign is going to significantly beat down the life of any other signage option, because they’re made to be that way. They’re resilient and sturdy, no matter what. 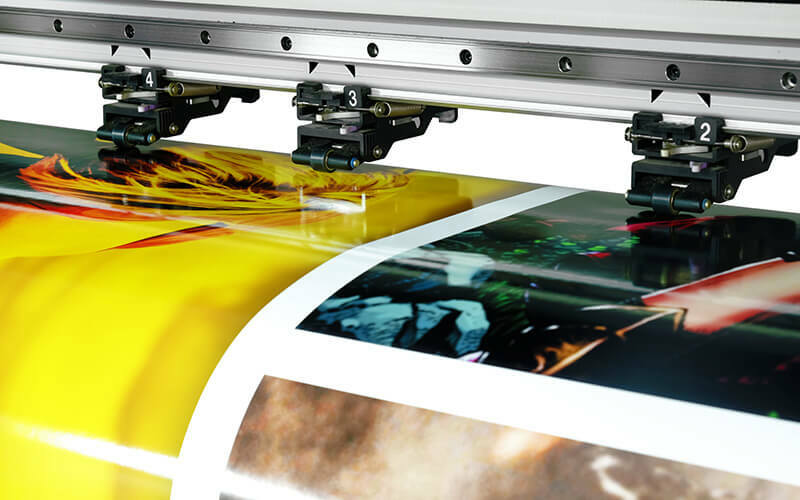 Island Printing is one of the Gold Coast’s leading large format digital printers, providing a fantastic service and unbeatable value for money. We completely understand that that signage can be vital to the identity of your business, and we will help you to choose the best, long lasting and high quality a-frames around. We offer a complete, professional graphic design and printing service and we invite you to give us a call today and try us out! Basic A Frame Sign Price List! All prices exclude GST. This is a basic price list only. For a custom quote please fill out our Quote Request Form. How long will it take to make my A Frame Sign? We can produce your A Frame Sign within 2-3 business days from the time that your artwork is approved and signed off. For urgent requests please contact us. 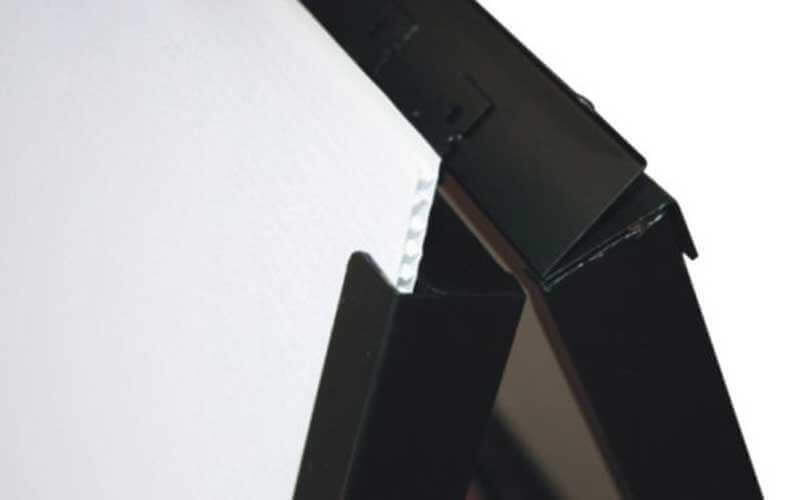 What is the difference between metal and corflute insert A Frame Signs? A metal A Frame Sign is printed on permanent vinyl and is laminated for UV protection. These are long lasting signs (5-7 years outdoors). A corflute insert sign is for shorter term use and can be interchanged more frequently (1-2 years outdoors). Can these A Frames be used outdoors? YES! A Frame signs can be used outdoors!